We would love to be your vacation place! 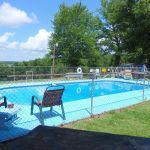 Blue Waters Resort is one of the first resorts built in the area shortly after they dammed the White River to form Bull Shoals Lake. 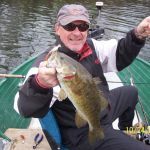 Because of the outstanding fishing on Bull Shoals Lake the resort became very popular. We are proud to continue the tradition of operating a friendly clean resort where everyone feels welcome. You can truly enjoy our unique get-away to beautiful Bull Shoals Lake cabins on the southern Missouri/Northern Arkansas border. Located on Bull Shoals Lake near Buck Creek & Shoal Creek in Protem, MO (note we have a Missouri address but are really in Arkansas.) 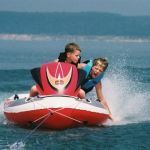 The pristine waters and lush foliage create an oasis of peace where you can spend the day just taking in the beautiful scenery and breathtaking sunsets or you can hike, picnic, water ski, swim, fish, take an exhilarating spin around the lake or visit the many attractions of Branson Missouri, only an hour away. 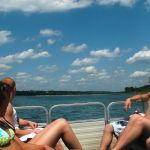 Bring your clothes, camera, food, fishing equipment, and lake toys and enjoy the peace and solitude of your very own lake side Ozark Mountain cabin. We also offer full hook-ups for your RV, all with a gorgeous view of the lake on an annual lease. What’s your ideal vacation? It’s here at Blue Waters Resort on Bull Shoals Lake. Bull Shoals Lake is renowned for its monster striped bass, largemouth bass, crappie and delicious walleye. 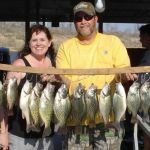 Straddling the Missouri and Arkansas border, it’s a great lake to whet a youngster’s appetite for a day or night of family fishing. Pavilion, BBQ pits and more! We offer 10 clean, comfortable cabins for your stay. All kitchens have a full size refrigerator, microwave, coffee pot, 4 burner stove, oven, toaster and coffee makers. We also provide linens for all beds. We also furnish towels for use in your cabin bath, hand , and wash clothes and toilet paper, liquid hand soap. Each cabin has a charcoal grill so you may want to bring charcoal and lighter fluid or you can purchase it in our store/office.